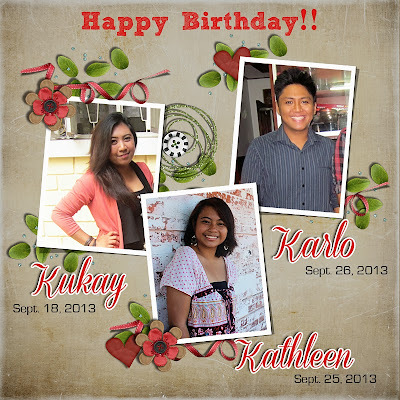 September is a month with the most of birthday celebrants in our family. My older brother is quick to notice that he is not included in the layout that I made lol. So, all in all there are 4 celebrants. Sept. 26 - Karlo, my nephew - his birth date (26th) is so memorable because 4 years ago (2009) a massive flood brought about by typhoon ONDOY left massive sufferings, destruction on properties and many people dead. My nieces and nephew are all college graduate now and starting to have their own careers now in their chosen fields. I wish them all good luck.